Here’s one last holiday themed post in case you’re still looking for an easy, homemade gift that won’t break the bank. I liked this recipe so much that I plan on making it again for The Mistah and I and Santa to snack on. BAH Note: As much as I like the all Chex version that Alice posted, and that we already packaged and sent out, I think it needs a salty component. Use whatever combination of Chex you like. Alice included wheat in addition to the corn and rice Chex. I decided to leave wheat out of mine. Also, I found it easier to use my hands to combine the melted chocolate, peanut butter, and butter with the cereal. Yes, it’s messy as hell but I think it kept more of the cereal squares from breaking. Be sure to use a big enough bowl so that you have enough room to get in there and really mix things up. Measure out the cereal and pretzels into a large bowl and set aside. Combine the chocolate chips, butter, and peanut butter in a microwave safe bowl. Microwave on high in 30 second intervals, stirring between each, until the mixture is melted and smooth. Stir in vanilla. Pour the melted mixture over the cereal and pretzels and gently stir to combine until the cereal is evenly coated. Divide the coated cereal between two 1 gallon zip top bags and add half of the powdered sugar to each bag. Seal the bags and gently shake until the powdered sugar evenly coats the cereal. Spread the cereal on a parchment lined sheet pan to set up and then package in airtight containers. Santa should surely bring you that le creuset with this out as a snack! Have a great Christmas, Wendi. What are you and the Mistah up to? Unfortunately, Santa’s budget was downsized this year…damn economy…so no Le Creuset. Maybe next year. We’re staying put in Bawlmer for Christmas. I just commented to The Mistah this morning, as we saw that people are still trying to get out of airports, that I’m glad we don’t travel for the holidays. I think we’re heading over to Hampden on Wednesday to take in the lights. What about you and Noel? Consider that earworm my special Christmas gift to you hon! Puppy chow… my mouth is watering. I was toying with the idea of subbing Nutella for the chocolate and peanut butter. Maybe I’ll try that after Santa finishes up the most recent batch I made. We’re going to Slower Lower, to see my sister, then over several rivers and bunches of woods to Noel’s grandmother’s house in norther centeral pa. It will be a long trip, but fun. I suggest you pack some Scooby Snacks for that ride. Happy Holidays and have a safe trip. Oh hell yeah muddy buddies!!! I don’t know where the puppy chow name came from, but that ugly sweater party I went to, our friend Megan brought this same recipe and called it puppy chow! That is a perfect snack for sitting and looking out the window at all the snow! I couldn’t bring myself to call it Puppy Chow. It just sounds so wrong…but it tastes so right. Emily, hope you found some Christmas crabs up there in the Windy City to make your holiday complete. One caveat for those of us who sport long fingernails. Yes, the best way to mix this is with hands. However, it plays hell getting chocolate and peanut butter out from under said nails. You know, donning a pair of food gloves isn’t a bad idea if even you don’t have long finger nails. Because the melted chocolate, butter, and peanut butter makes your hands incredibly messy. Thanks for the tip Emily. NAH, no Christmas crabs……er…not the eating kind anyway Plenty walking the streets and blowing in the snow! I AM looking forward to a New Year’s Lobster however..with drawn butter and a baked potato and a waldorf salad or two…and of course some bubbly in the cold. I guess Christmas crabs just doesn’t translate well to other parts of the country. New Year’s lobster sounds like a winner. We’ll be having Ina’s shrimp cocktail and pasta with white truffle butter cream sauce. Good lord, I hope my doctor does not read this. I think my cholesterol went up 20 points just typing that. I can’t just have them once a year I love um year round and all those names that people call them is fine with me. Scooby snacks is my favorite thing to call them. 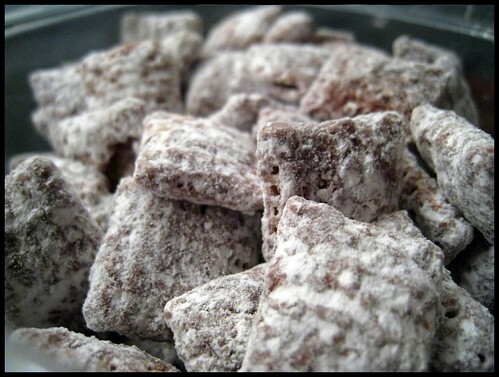 So Muddie Buddies, Puppy Chow, or Scooby Snacks it all means one thing…..YUMMY TO MY TUMMY!!!!!! !